I am very pleased to present the new Excel Calendar template. Download this new Calendar Excel template and create your own personalized calendars in Excel. In this post, we will be discussing the following. Customize calendars by choosing the Year, Starting month and Starting day of week. All 17 designs are ready to be printed. Can be Exported to PDF as well. Now, let’s see each step in detail. By default the year begins in January. However, you can modify that to start the calendar with any month. By default, the calendar shows weeks starting in Sunday. However, you can modify it to start with any weekday. We can give a name to our calendar and the name will appear on some of the calendar designs automatically. Calendars show weekend days in red colored font. You can modify the weekends as needed for your purpose. In the image above, I have selected Saturday and Sunday as weekends. So, all Saturdays and Sundays will be shown in red font on the calendars. 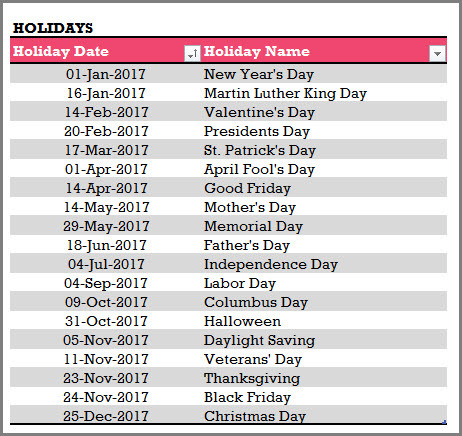 Enter the list of holidays for your company or business in the Holidays table. I have provided a list of holidays in U.S. and India for reference. Please see the Holidays sheet. I have used Excel Tables for user input. If you are new to Excel tables, please see my article on How to use Excel tables for data entry? The template allows the user to enter events, in addition to holidays, to display on the calendars. If you are using this template for personal calendar, you can enter your personal events as I have done in the above image. If you need to create a calendar for your company, enter your company events for 2017 in the Events table. Based on the input provided in the previous 4 steps, the template builds the calendar designs. The 2017 calendar template offers 17 different calendar designs to choose from. In the Pick a Calendar sheet, we can see the 17 designs. 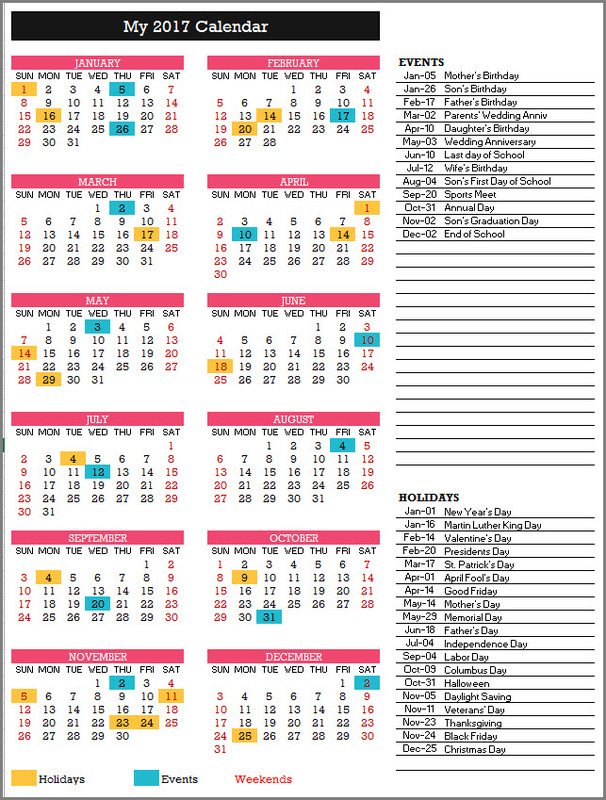 Just click on any design on and you will be taken to the corresponding calendar sheet. You can also directly go to any of the sheets named 1 to 17. Note: If you change the sheet names of the calendars, then hyperlinks in the Pick a Calendar sheet will not work. Excel’s default print menu options and Export options work as usual. If you are not familiar, it is not a problem. I explain them in detail with screenshots towards the end of this post. Let’s look at each of the 17 calendar designs. This design prints the entire year in 1 page. The 12 months are shown in 4 rows X 3 columns. The Holidays, Events and Weekends are highlighted on the calendar. Holiday Names and Event Names are not listed in this design. There is a place to enter any notes at the bottom of the page. When both Event and Holiday fall on the same day, Event is prioritized and event color is displayed. The 12 months are shown in 3 rows X 4 columns. The 12 months are shown in 2 rows X 6 columns. 20 Holiday Names and 20 Event Names are listed in this design. The 12 months are shown in 6 rows X 2 columns. 20 Holiday Names and 30 Event Names are listed in this design. The 12 months are shown in 12 rows X 42 columns. 10 Holiday Names and 20 Event Names are listed in this design. The 12 months are shown in 12 rows X 31 columns. This design prints the entire year in 6 pages. The 12 months are shown in 31 rows X 12 columns. Type notes directly next to each date on the calendar. The 12 months are shown in 54 rows X 7 columns. The Holidays and Events are not highlighted on the calendar. This design prints the entire year in 12 pages. The 12 months are shown as one month in each page and each month as 6 rows X 7 columns. The 12 months are shown as 2 months in each page and each month as 6 rows X 7 columns. 10 Holiday Names and 10 Event Names are listed for each month in this design. This design prints the entire year in 4 pages. The 12 months are shown as 3 months in each page and each month as 6 rows X 7 columns. 5 Holiday Names and 5 Event Names are listed for each month in this design. This design prints the entire year in 3 pages. The 12 months are shown as 4 months in each page and each month as 6 rows X 7 columns. This design prints the entire year in 2 pages. The 12 months are shown as 6 months in each page and each month as 6 rows X 7 columns. The 12 months are shown as 1 month in each page and each month as 6 rows X 7 columns. Holiday Names and Event Names are listed for each month in this design. Holiday Names and Event Names are not listed for each month in this design. Type any text just below any date directly on the Calendar. Right Click on image and change picture for each month. Click on placeholder text and type any text for each month. Create your own customized calendar of quotes. 1. How to change formatting (colors/fonts/borders)? One of the common reasons for making changes would be to change the formatting of the calendar. I am sure that you may have your personal favorites when it comes to colors and fonts. The template is designed so that you can make these changes yourself without negatively affecting the functionality of the calendar. Select the cells you want to change formatting. For example, in the image above, I have selected the 2 months (January & February). In the Home ribbon, you will see the Font section (as shown below). We can change the font, font size, font color, fill color, borders and also apply bold and italics format. For example, when I changed the font, applied bold text and reduced the font size, it appears like this. Some of the border options require unprotecting the sheet. We will see how we can unprotect later in this post. If you change the font color, the dates’ color will change except for the Weekends. Weekends are set up to show with red color. If you change the fill color, you will notice that the days with Holidays and Events will not change. Holidays and Events are set up separately with their own colors. I will explain now how both the above points can also be addressed. 2. How to change Event and Holiday colors? Events and Holidays are colored automatically on the calendar using conditional formatting. As with everything with this template, it’s easy to change them too. First, click on Conditional Formatting menu in the Home ribbon, and select Manage Rules. The next dialog box shows the 3 rules we have used in this worksheet. Make sure that you choose ‘This worksheet‘ at the top. We can modify each of the rules separately. Just click on one of the rules and then click on ‘Edit Rule’ button. In this example, I have clicked on the ‘Events’ rule. Click on the Format button. It opens the next dialog box. We can modify not just the fill color, but also the Number format, font and border. For this tutorial, I have just highlighted where you can change the background fill color. You can choose one of the standard colors or click on ‘More Colors‘ button to choose any color from the spectrum. Click OK to the dialog box and then the following open dialog boxes. Then, you should see the changes applied to the entire calendar sheet. Save the file to save the changes. 3. How to change the order in which events/holidays appear on calendar? Some of the calendar designs list the names of events and holidays on the calendar. They are designed to be listed in the same order in which they were entered in the Holidays and Events tables in Settings sheet. If you had entered them in a random order in the tables, then you can easily sort them. For example, in the Events table, click on the Event Date header label. A menu pops up where you can choose ‘Sort Oldest to Newest‘. This would sort the Events table with dates in ascending order. You can apply the same technique to the Holidays table. 4. How to change the date format for events and holidays? I have used the date format MMM-DD (example: Jan-05) to show the dates. I usually try to show the month in text instead of numbers as I understand that there are differences in formats used by different countries. 1/5 could be interpreted as Jan 5th or May 1st, depending on which country you live in. However, you can easily change it to any format to suit your needs. Just select the cells where you want to apply the change. Then, press Ctrl+1 to open the Format cells dialog box. You can type your own custom format or click on ‘Date’ in the list on the left. Then, you can choose from the standard date formats. 5. How to unprotect (unlock) sheets? All the customization mentioned above can be made without unprotecting any sheets. If you plan to make more modifications and you see that you are not able to, you can unprotect using indzara as password. For more details, please see my article on how to unprotect sheets. Please remember to protect the sheets again in order to prevent accidental editing of formulas. 6. How to print calendars? To print, press Ctrl+P or find the Print option in the File menu. Since the template is already pre-set for printing calendars, you can quickly review the calendar in preview and then click on Print to print. If you need to print only a subset of pages, please enter page number range. 7. How to export calendar to PDF? To export to PDF, choose Export in the File menu and then click on Create PDF/XPS. Choose the place in your computer to store the PDF. If you need to control which pages are being exported to PDF, click on Options. That will open the following window. Choose specific page numbers you want to export and click OK.
4. Click Publish to publish PDF. I hope you find this sheet useful. Please share with your friends if you do. Please leave a comment below to let me know your feedback. Thank you. I cannot figure out why sometimes my events are published on the calendar, but sometimes they are not. Can you assist me? We have tested this template on Excel 2010 and above. Hence, cannot confirm if it will work on Excel 2007. Hi there! Fantastic resource, thank you so much for loading this. I’m trying to create a calendar for 2017 using template 1 with the weeks starting on a Saturday. When I do this the dates don’t fill in and I get left with a blank week. I was going to type them in by hand but the sheet is password protected so I cant. Can you help at all? Can you please clarify whether you see a blank week as the first week? If so, which month? I tried it just now and everything populated as expected. Please email me file to support@indzara.com. This is a brilliant calendar. One question. Is it possible to add another column in the Settings Worksheet in the Events Table after the Event Name called “Owner” or “Contact Person” that would show in the calendars? What would be the formula? Please check whether the data is entered inside the table correctly. This is the most common reason. If there are further questions, please email the file to indzara@gmail.com. 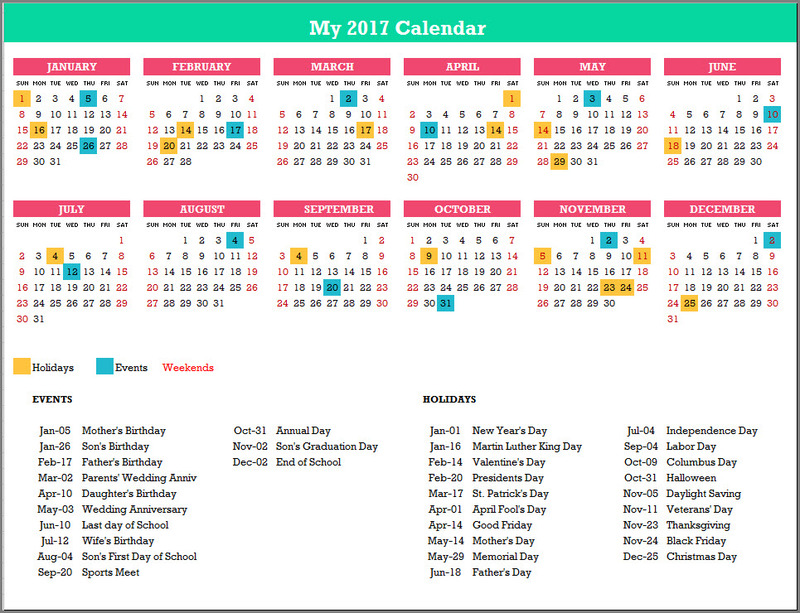 I did not hesitate to download your 2017 Calendar as I have used your ‘Event Calendar Maker’ in my workplace and found it to be very easy to set up and use. I know this new Calendar will assist me greatly. Thank you very much. I am glad to hear that you find the templates useful. Best wishes. Thank you so much!! You are great for giving this great format template. You are very welcome. I am glad you like it. Thanks for the feedback. Best wishes.